I've been shuffling around a few things in the duplex lately—trying to do a bit of spring re-decorating. Every six months or so, I start to get antsy about my surroundings and feel a strong urge to spend a bunch of money on new frames, pillow covers, chair cushions, and brightly colored bathroom towels. Oh, to be rich beyond all reason and have the ability to actually do and buy the things I dream of! For now, I'll settle on cute owl vases I find on clearance at Michaels and other inexpensive things of that nature. Like rearranging items I already have so that they feel sort of new. I'm good at that sort of trickery. I've been attempting the same sort of thing with my wardrobe, as well, which is mostly rewarding in some weird way, but also annoying because all I really want to do is buy every single thing I see at Old Navy these days. I found this free printable on Studio Pebbles and was excited to print it out and replace one of the faded-in-the-sunshine pictures that had been on this wall for months. (And I also have printer ink for the first time in a while, so it's time to print out every single thing I find on Pinterest. I should probably start a printer ink fund.) When it comes to this specific print, I love the colors and the typography, and, um, hello? This quote is something I kind of need to have staring me in the face on a daily basis. I like making tiny changes throughout our home that catch my eye throughout the day. Different photos in frames, a new arrangement on our bookshelves, an updated collage of pictures and papers on the front of our fridge. It gives a bit of freshness and energy to the place I spend most of my time. Which somehow feels very important to me lately. "This quote is something I kind of need to have staring me in the face on a daily basis." Oy, me too. Thank you. I love the color scheme you've got going on here. I love the quote - I need that in my office! Have you read Daring Greatly, by Brene Brown? I feel like you would like it and find it valuable. One of my takeaways from the book was that perfectionism is placing more value on the response people give to you (or your work or your personality or whatever) than the pursuit of excellence in what you actually are (or produce or behave). 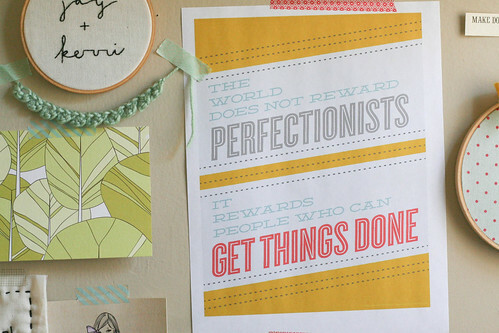 So you could be a perfectionist without being excellent. That blew my mind. 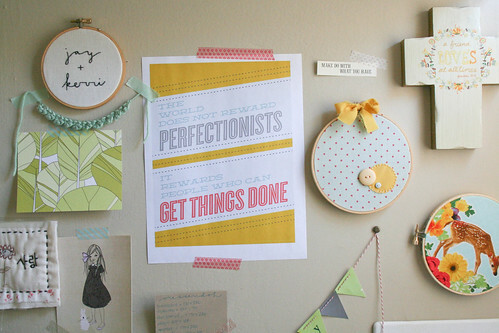 This wall is just darling! I love putting bits of fabric in hoops...I have several in my sewing room! so fun! love catching up your blog :) you always make me smile SO big.